On Main Street, the window displays of the venerable retailer reflect its attempts to keep up with the times. I was a kindergartner at First Baptist Academy when I first saw Neiman Marcus’ display windows. At that time, in the ’90s, the academy shared space with First Baptist Church, in downtown Dallas. Now the school is in East Dallas, and I’m a visual historian pursuing a Ph.D. at SMU. But the windows remain. Every weekday morning throughout my grade school years, as my parents or my grandfather turned their car onto Ervay, I paid attention to the left side of the street. The corner of Ervay and Main was where the magic happened. There I would find scenes of the opulent and the avant-garde, with mannequins styled in evening gowns, cocktail dresses, wedding gowns, tailcoats, tuxedos, and tailored suits. There were bright colors, lush fabrics, and accessories that sparkled. When formal and cocktail attire were not being advertised, there were clothes on display that I imagined would be worn to church, high tea, or even a royal wedding: hats and knee-length, A-line dresses for women and morning suits for men. The mannequins were only part of the show. Neiman Marcus gave equal attention to the environment, creating scenery that coordinated with each garment. One could not only envision wearing the attire but also learn under what circumstances the clothes could and should be worn. It was all a beautiful lesson about a certain type of excellence: namely, how to be appropriately adorned for life’s most exquisite occasions. Decorated for French Fortnight in 1957. The retail industry no longer gives physical stores the opportunity to be the sole educators of their clientele or the general public. People can now watch fashion shows in real time on their phones, get styling tips from YouTube and Instagram, and shop from home. Neiman Marcus has not been immune to the struggles of a changing industry and is trying to bounce back from its own specific financial challenges, which include long-term debt and liabilities in excess of $5 billion resulting from leveraged buyouts in 2005 and 2013. Despite these setbacks, the luxury brand reported its third consecutive quarter of sales gains in June. Part of that success comes from Neiman’s increased online sales. However, the store’s physical presence—which helped establish its legendary reputation—is still contributing to the brand’s success in new and surprising ways. Ray Souders, the downtown store’s visual stylist and a 30-year veteran of the window-dressing team, says that he and his colleagues have been trying to make sure that customers don’t see the store as a superfluous place, filled with people who only care about presenting luxury and glamour. Instead, they are trying to walk with people through their daily lives. Instead of primarily preparing its customers for life’s remarkable moments, Neiman’s is attempting to dress clients for their everyday lives. To do that, the store is embracing a less formal, more inclusive visual presentation. Instead of primarily preparing its customers for life’s remarkable moments, Neiman’s is attempting to dress clients for their everyday lives. There are blouses of exquisite fabrics, simply cut business suits, versatile jewelry, and shoes that could be comfortably worn for any weekday occasion. Souders says that the store’s senior vice president and fashion director, Ken Downing, humorously has started referring to certain daylight glam-wear as “Starbucks sequins,” because people are now incorporating evening attire into their daytime routines. The window settings, which have been reduced to “white boxes” that are simply lit to focus on the mannequins, are a way to emphasize and encourage that sense of individual artistic freedom. In addition to taking a more fluid approach to adornment, the store has expanded its relationship with the arts. Stanley Marcus started the company’s extensive art collection in 1951 with the purchase of an Alexander Calder mobile. That collection now includes more than 2,500 pieces, including works by Pablo Picasso and Roy Lichtenstein, that have been displayed in stores throughout the country. 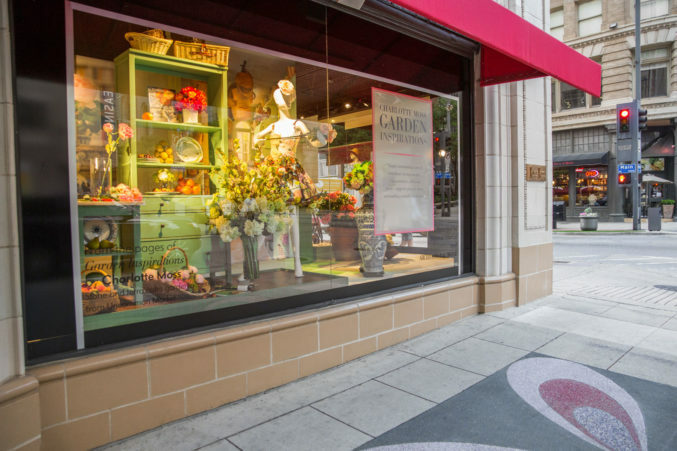 But recently art started coming from outside the building, after the Dallas Museum of Art approached Neiman’s about promoting some of their exhibitions in the store’s windows. Jim Pedersen, Neiman’s regional visual manager for North Texas, saw it as an opportunity to give back to the local community and welcomed the collaboration. 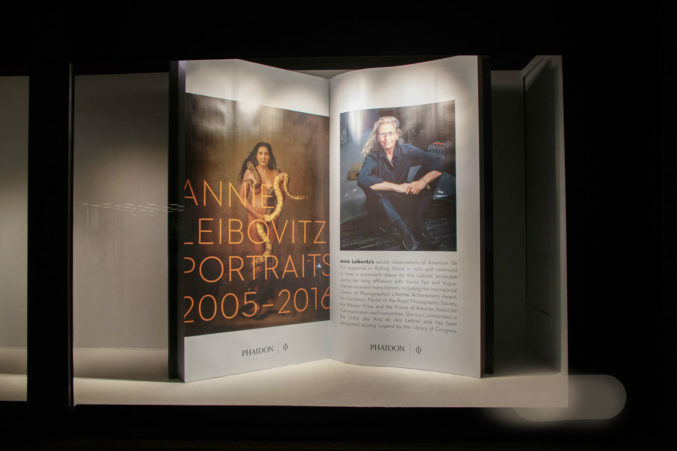 Last November, to celebrate the visit of renowned photographer Annie Leibovitz, the store displayed the cover of her latest book—a life-size photo of a naked woman with a snake providing strategic coverage—in one of its windows. In the spring, the store arrayed its windows with images of golden African figurines from the Asante Empire of Ghana. These figures were a part of a recent DMA exhibition, “The Power of Gold: Asante Royal Regalia From Ghana.” Most of the exhibition’s pieces represented functional items (spoons, bowls, and swords) and ceremonial objects (crowns, badges, and stools) from Ghana at the height of its monarchical and hierarchical power. This summer, the downtown store presented a home and gift display that was arranged as a modern art exhibition using a high-low mix of Champagne flutes, plates, bowls, and table decorations in various shapes, sizes, colors, and materials. As a 5-year-old, I never would have expected to see glass in lieu of Waterford crystal. Yet it works. The changing windows reflect the fact that downtown Dallas is no longer a place where people primarily come to attend special occasions; it is a place where a substantial number of Dallas’ citizenry work, live, and socialize. The windows also no longer function in a vacuum. They now have neighbors that reiterate their artistic themes. The Joule Hotel sits next door, filled with abstract sculptures, stained-glass art, and the Taschen Library, which specializes in photography and visual art books. Across the street is Forty Five Ten, with its striking architectural façade, kinetic Lucea sculpture, and the Eye. One of Dallas’ newest conceptual art galleries, Ro2 Art, established its second storefront across the street. A collaboration with interior designer Charlotte Moss. As a Neiman’s customer and lifetime window-watcher, I relish the evolution unfolding before my eyes. All great institutions and people adjust their aesthetic presentations when necessary. I am reminded of King Louis XIV of France, who decided to create a more reserved look during the 17th century in response to the ornate Baroque aesthetic. The switch to restrained luxury became the impetus behind the rebuilding of the Louvre, his former palace, and the well-known Louis XIV, XV, and XVI furniture and architectural styles that became the standard for regal aestheticism all over the world, until the end of the 20th century. 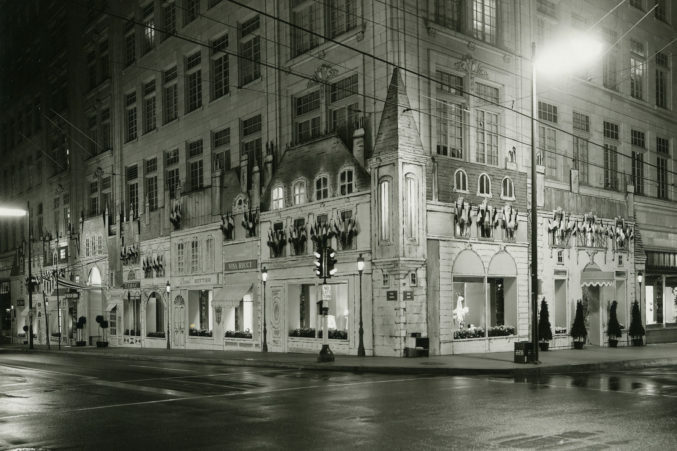 I also think about Rudyard Kipling, who wrote in his poem “If—” about walking with kings without losing “the common touch.” By displaying less formal garments in its windows and incorporating modern and eclectic works of art, the downtown Neiman Marcus store has not lost any of its grandeur. It is simply providing a welcome common touch.